After a long day at the Clinic and much testing, Kyle and I were exhausted. Making dinner was not going to happen so we drove around Durham for a fast food place. Embarrassingly enough I had a killer craving for a hamburger and we had to find just the right place. Wendy's it was. After cramming my face with burger and Kyle's belly full of chili we finally started to hit relax mode. Once we had watched our Wednesday night favorites, Law and Order SVU and Dateline, Kyle reached to turn the lamp off to call'er a day and then his phone started ringing (11:01p.m.). He turned to me and was like "Are you kidding me?" He answered the call and I immediately knew it was the call we were hoping for. I jumped out of bed and started running around the house like a crazy person throwing all my electronics in a bag and prepping the dogs for a night alone. We jumped in the car both speechless, and me trying not to speed. After what felt like an hour we were at the hospital ER door waiting for them to transport us to Pre-Op. While waiting at the desk, Kyle of course ran out of air and I kept telling the attendants "hey, we need air and a wheelchair." Once the transport person came to take us to Pre-Op she still didn't have air or a wheelchair so I went on a scramble mission to find a wheel chair in the waiting room and she finally found some air. I was trying to not be frustrated, but come on, this is stressful enough. Kyle and I kept looking at each other like, of course we would be stuck with a new person. After taking a detour and getting lost with the new transport. I finally called the coordinator for directions. I think Kyle and I were drenched in sweat at this point. When we finally arrived at Pre-Op they greeted him with a gown and immediate testing. We joked with the nurse because they asked how many times we had gone through this process and we told them it was our first run. I said we are hoping for a one and done. To give you some background, most people who are waiting for transplant normally experience one or more "dry runs" as they call it. This is when they find a donor match and in some cases call in more than one candidate and prep each candidate with testing, and while that is taking place the doctor is out looking at the lungs. In many cases the doctor decides the lungs are not suitable for transplant due to damage or compatibility. So, joking aside, Kyle and I were staying realistic as our doctor had told us we on average may experience two to three dry runs before he would get his match. The reason being, he needed both a kidney and lungs that were compatible to his body type, blood type and antibodies. Once he had completed the testing, and after taking twenty plus vials of blood (the nurses always claim they are vampires) we hung out in the dark hospital room watching Duck Commander as we both nodded in and out of sleep. I woke at every noise thinking they were going to tell us the big news. Then, time started to drag and it was about 7:00a.m. and they told us we had to move rooms. Once we got settled into the new room Kyle yelled at me to get my water glass out of sight because he couldn't have any water and he loves his drinks. So I immediately disposed of it, ha ha. At 9:22a.m. 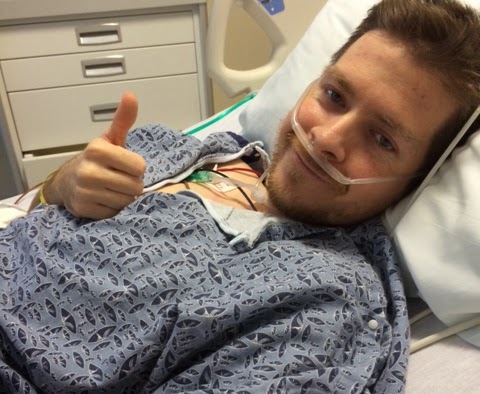 Kyle's coordinator called and said things were really looking positive for transplant. We tried to contain our excitement as nothing is for sure until they making the first incision. We then spoke with the lung and kidney transplant surgeon and they told us that it was time to contact family as it would be the last time Kyle would have his phone available before he went to the OR. We called our family, and I don't think anyone believed us at first because of course we decided not to call them until it was pretty much a for sure thing. Kyle before he went into the OR for his big surgery. Once our family said their I love yous, we sat and waited and at about 11:30a.m. the coordinator called and said it was a go and they were taking him back to the OR immediately to prep. This was the most exciting, scary feeling I had ever experienced. Kyle gave me a strong tearful hug and we both told each other it was going to be okay, and that we loved one another. Without skipping a beat they swept him off to the OR. I sat there for a second not knowing what to do. The nurse helped me get ahold of the valet so I could put his stuff in the car. I couldn't wait to get rid of his oxygen roll cart, his signature accessory for the last 9 months. As the nurse was calling the valet to bring our van around a women asked me to help her send a message to multiple contacts in her iphone. As I stood there giving her a tutorial I kept thinking, my husband is in the OR getting a transplant and I am giving a women iphone tutorials. It was a surreal feeling. Now settled up in the busy Pre-Op waiting room I was given a pager to notify me of any updates. I waited anxiously to get that first message notifying me of the surgery start. I was called at 3:05p.m Thursday, November 21st and told they had made the first incision. At 3:53p.m. the lung transplant portion of the surgery had started. As hours passed and I made friends with people in the waiting room, one of which use to be a commercial jet pilot, who use to transport organs. It is amazing the lives touch by organ donation, in all aspects of the process. As the day turned to evening and then almost to early morning the lung transplant surgeon Dr. Mani Daneshmand came out around 11:30 or so. He walked over and basically threw himself into the chair. I asked him if he was tired and he said, well, yeah, kind of been a long day. I chuckled nervously, then asked him to give it to me straight, were there any complications? As the last time I had spoken to the nurse it seemed a bit different. Dr. Daneshmand quickly divulged the complexity of the surgery from the get go. Kyle's lungs were small and hardened with scar tissue and they couldn't get him to start breathing on the ventilator because his lungs were too stiff, they just didn't want to work. After quickly realizing the surgery was to take a difficult path he placed Kyle on the ECMO machine. He proceeded to lose excess amounts of blood because of the surgery and the use of the ECMO machine, but as they finished they placed the ECMO in his neck to help Kyle breathing and oxygenating his blood. Due to the intense surgery and the trauma Kyle had endured the pushed the kidney transplant until Friday morning, so his body would rest. Tina, and I patiently tried to sleep in the waiting room of the ICU until they called our name to go back and see him. As we approached his room I felt fatigued, I hadn't slept in two nights, but I thought I had mentally prepared myself for what I was about to see. I couldn't help but feel faint when I saw my husband lifeless and without color on his hospital bed. It is a sight I pray to never witness again as my heart was shattered. All of the tales of patients looking pink and full of color with there newly oxygenating lungs, Kyle wasn't showing any signs of this as he had lost so much blood in surgery. Once we gathered ourselves we whispered our I love yous and went back to the waiting room. hey tried fixing but they said it could be a concern in the future and there was a possibility the bottom lobe of lung would have to remove if there was too much constriction. Eventually, 6:00a.m approached and we took our places back at the Pre-Op floor. As 6:00a.m. came and went we finally heard he had been taken to surgery around 7:00a.m. After a longer than normal surgery due to excess oozing and blood loss (because of the medications he was on for the ECMO) we spoke with the kidney doctor at 12:00p.m. He said the surgery was long and hard because of the oozing but he was happy with kidney he had transplanted. He informed us that it wasn't producing urine and it could take a week or more for the kidney to "wake up." This was normal in a multi-organ transplant. Once we got to see him after the kidney surgery he was attached even more machines keeping him alive and stable. I then spent the night at home to get some much needed rest. Of course the minute I got home Tina called and said he needed to go back to the OR because the kidney transplant team saw some fluid around his kidney and wanted to open him up to inspect the area. Luckily the process was quick and he didn't have the issue they had thought initially. The first 24 hours were a roller-coaster ride, and Kyle had endured major trauma to his body. Saturday they decided to give him a day of much needed day of rest as they tried to keep him stable and kept him heavily sedated. They woke him just enough to check his cognitive state, so they asked him to wiggle his toes and hands. They had issues getting a radial pulse in his right hand and they continued to place hot packs on his hands to bring blood to his extremities. Sunday, after is second bronchoscope they found a bacteria growing in his lungs and started treating it immediately with new antibiotics. They then took a CT Scan to view his lung progress and found a constricted area in the left lung. They couldn't tell if this is something that would need to be evaluated again later but they were keeping a close eye. Monday, he started making more urine and they kept him stable and comfortable and kept on top of his ever changing vitals and meds. On Tuesday morning they decided to perform a tracheotomy so he would be more comfortable without a large tube in his mouth and it would give the doctors an opportunity to take him on and off the ventilator easily if need be. They performed the surgery in his room as it would be more comfortable for him. The surgery went off without a hitch. After an afternoon of closely monitoring him, at about 9:00p.m. they started to take him off his sedation meds. After a few hours he started to be completely aware of his surroundings and mouthed words to me as he needed things. They were happy with his progression so they took him off the ventilator briefly to see how he would do and he did a great job. The only issue was they needed to place a tube in his nose which went to his stomach to remove the excess gas build-up in his stomach. After 5 tries and his pulse ox decreasing they stopped making any attempts and placed him back on the ventilator to make him more comfortable. That leads us today. He is still off sedation and they were able to get the tube in his nose to release the gas in his stomach so he can take bigger breaths and avoid aspirating in his lungs. We are so very grateful for the continued love and support from family and friends. 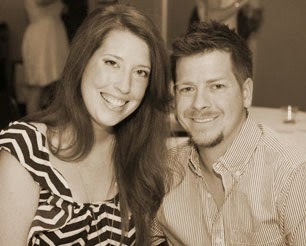 Kyle is gaining strength everyday with your prayers. Love you all so very much. Such a powerful story about the strength and love between you and Kyle. Thank you for sharing and keeping us up to date! My thoughts are prayers are with you both. Can not stop thinking of you two. Sending you good thoughts and hoping for a fast and health recovery! Havent stoppeding thinking and praying for both you and Kyle. We love you both! You both, without a doubt, are the strongest people I have ever known. Thinking of you and praying like a mad women! I love you both dearly. Keep your head up sister! Girl, you are the most amazing woman I have ever had the pleasure of knowing! You have been a rock for so many people, including me, throughout our lives and it's definitely our pleasure to return the favor to you and Kyle. Kyle is so blessed to have you by his side and the love you two share has impacted so many people. I will continue to keep you both in my prayers. I cannot wait to see you both again. Much love! Thanks for writting this for all of us! You are so strong Stephie Lou! Keep the faith and know that many prayers are being said for not only Kyle and all the doctors, but for you too! Sending ~HUGS~ your way! Love you both! Thanks so much for sharing! We all at Mehta Tech have been praying for you all like crazy. I hate to text Tina too much because I know she probably has tons contacting her, but hate to not text because I want her to know how much we are thinking of you all! Grateful for the blog, lets everyone know Kyles progress. Tina is a wonderful lady and we have been anxious for every little bit of news. Thoughts and prayers with your family. Prayers to the whole family. Hoping Kyle continues to improve. Thanks for the blog. It's nice to keep track of Kyle's progress. We at Mehta Tech love you Tina.